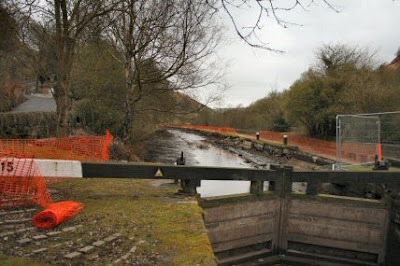 Took the time today to bike up to Todmoreden to see how the work is progressing on the locks above us. 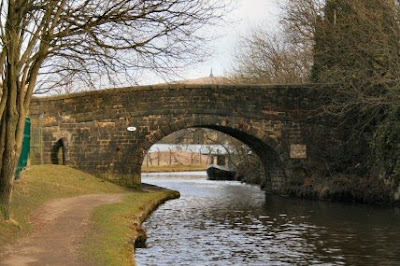 The first hint of the job in hand was the de-watered section of canal above Lock 15. A couple of planks are in by the lock gate to stop all the water coming down so that they don't have to worry about the fish. 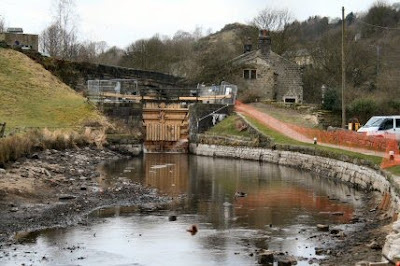 At Lock 16 (Lobb Mill) work has been nearly finished on the gates with new bottom gates standing out against the old lock stone like a sore thumb. One thing I do wish that BW would do is to involve volunteers whenever they drop the water levels. Now is the time to get the rubbish out while you can see it on the bottom. There is not a great deal in this section but the rubbish that is there could easily be removed to save problems later. Wandered around Todmorden for a while and found that there is a Morrisons and Lidl plus quite a nice market and several charity shops for my reading material. Picked up some walks from the town for when we manage to get up. On the way back I spotted Stoodley Pike on the hill. 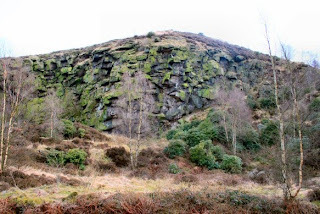 Its a lot nearer to Todmorden and there is a walk up to it with a walk back through the woods. Just for Caroline. Some geology. It is only the smallest of anti-synclines but there is a definite dip down on both sides and what looks like a fault running through it. 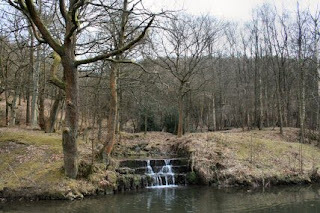 A bit further on and I came across the stream that I was following yesterday. Not much of a raging torrent but it has certainly cut its way down through the landscape.